11-1/2" wide. Click to enlarge for details. Bright Fall colors just in time for dinner. 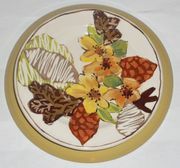 Set your table with 6 differently designed golden warm dinner and salad plates. Each one of your dinner guest will have their own unique pretty plate.